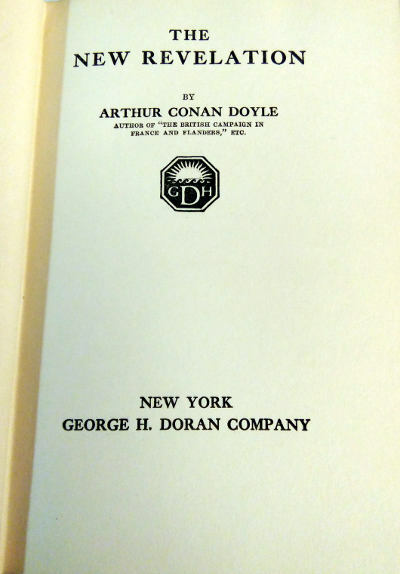 The 1st American edition, published the same year as the UK edition, of Arthur Conan Doyle’s first book on spiritualism. Publisher: George H. Doran, 1918. First US edition. Condition: Hardcover, no dust jacket. Very good. Inscription to ffep. 122pp., app 7.5″ by 5″. The (dis)connection between psychological (or scientific) and psychic mind is a subject that has baffled man for centuries. The phenomenon captured in a very particular way the attention of Sir Arthur Conan Doyle, a man in whom the analytic and artistic struggled for dominance, and inspired The New Revelation, originally published in 1918. The treatise deals not only with the issue of physical versus metaphysical, but also considers the problem of death (and afterlife) and the question of communication with the spirit world. Conan Doyle’s captivating prose and pragmatic, yet human, voice makes for an enlightening exploration of some eternally relevant questions-and possible answers. Scottish surgeon and political activist SIR ARTHUR CONAN DOYLE (1859-1930) turned his passions into stories and novels, producing fiction and nonfiction works sometimes controversial (The Great Boer War, 1900), sometimes fanciful (The Coming of the Fairies, 1922), and sometimes legendary (The Adventures of Sherlock Holmes, 1892). Sir Arthur Ignatius Conan Doyle KStJ DL (22 May 1859 – 7 July 1930) was a Scottish writer best known for his detective fiction featuring the character Sherlock Holmes. Originally a physician, in 1887 he published A Study in Scarlet, the first of four novels about Holmes and Dr. Watson. In addition, Doyle wrote over fifty short stories featuring the famous detective. The Sherlock Holmes stories are generally considered milestones in the field of crime fiction. During 1916, at the height of World War I, a change came over Conan Doyle’s beliefs prompted by the apparent psychic abilities of his children’s nanny, Lily Loder Symonds. This, combined with the deaths he saw around him, made him rationalise that Spiritualism was a “New Revelation” sent by God to bring solace to the bereaved. 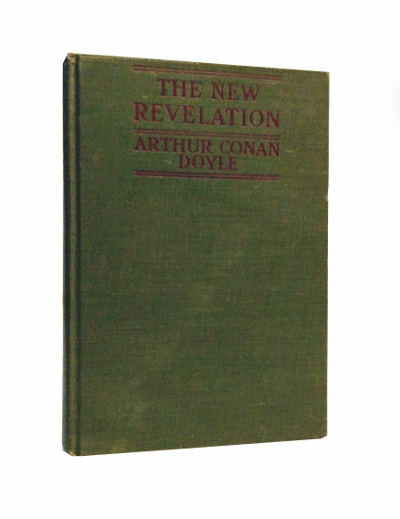 The New Revelation was the title of his first Spiritualist work, published two years later. In the intervening years, he wrote to Light magazine about his faith and lectured frequently on the truth of Spiritualism. Doyle was also inspired by his Spiritualist beliefs to write a novel on the subject, The Land of Mist, featuring the character Professor Challenger. He wrote many other non-fictional Spiritualist works; perhaps his most famous being The Coming of the Fairies (1922) which reveals Conan Doyle’s conviction in the veracity of the five Cottingley Fairies photographs. He reproduced them in the book, together with theories about the nature and existence of fairies and spirits. Initially suspected of being falsified, the photos were decades later determined to be faked (along with admissions from the photographers). Doyle was friends for a time with Harry Houdini, the American magician who himself became a prominent opponent of the Spiritualist movement in the 1920s following the death of his beloved mother. Although Houdini insisted that Spiritualist mediums employed trickery (and consistently exposed them as frauds), Doyle became convinced that Houdini himself possessed supernatural powers—a view expressed in Doyle’s The Edge of the Unknown. Houdini was apparently unable to convince Doyle that his feats were simply illusions, leading to a bitter public falling out between the two. A specific incident is recounted in memoirs by Houdini’s friend Bernard M. L. Ernst, in which Houdini performed an impressive trick at his home in the presence of Conan Doyle. Houdini assured Conan Doyle the trick was pure illusion and that he was attempting to prove a point about Doyle not “endorsing phenomena” simply because he had no explanation. According to Ernst, Conan Doyle refused to believe it was a trick.